Hey, you! Yeah, you... The guy with the cool game launching on Kickstarter. Your game looks fantastic. I love the artwork. The theme is great. The concept seems decent. Over 100 zombie miniatures! Woo hoo. Where do I sign? Actually, hold on a minute... Just wait... Can you do me a favour first? You see your rulebook? Yeah, that one. Do me a favour... burn it. Because it's junk. Tear it up, and start again, because you need to. What do you mean, "how do I know?" Okay, okay, hands up. I'm being a little unfair here. I only have limited experience with Kickstarter, and I know there are many campaigns that produce exceptional games with excellent rulebooks. But for the campaigns I have followed, poor rulebooks seem to be a recurring theme. I guess a lot of companies do not employ a technical editor, or fail to run the rules by enough playtesters first. It's a real shame, because sometimes a bad rulebook can really hurt a game. For example, I backed Dark Darker Darkest, and I love it. Unfortunately, there was not enough attention to detail with the rules, and while they were by no means terrible, they did end up getting rewritten by the designer, with some assistance from me and a group of very cool users from the BoardGameGeek community. For example, I backed Myth... I think I'll leave that one there. 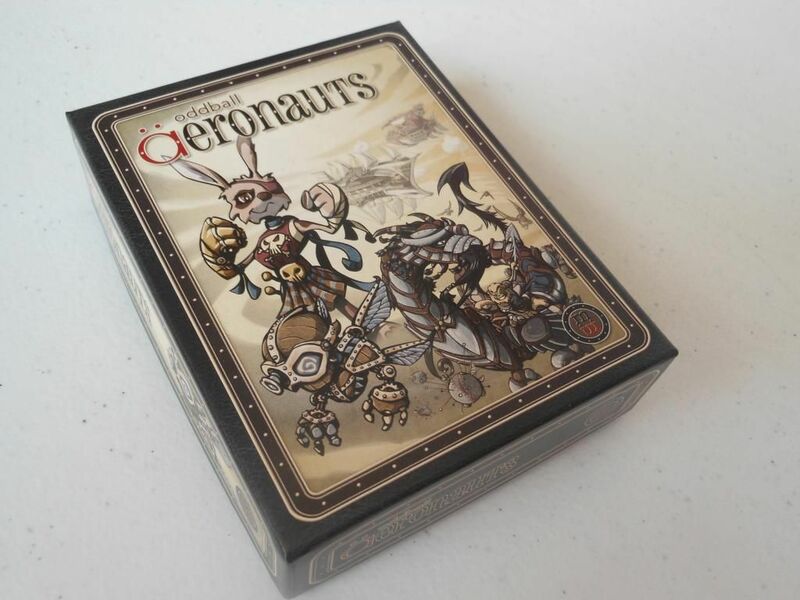 For those of you who don't know, oddball Aeronauts is a two-player card game with an interesting little twist: You do not need a table or playing surface of any kind. When I saw the game on Kickstarter, I was immediately enamoured by the concept of a light, two-player game that I could play sitting on the couch with my wife in the evening, without having to roll out the gaming table. That image fixed in my mind, and was ultimately why I backed. The fact the game has absolutely gorgeous artwork was a nice bonus. Indeed, when the game arrived, I was very impressed with the overall presentation; although I was disappointed to discover there was a considerable colour difference between cards, with some having white frames, and some having cream frames. The game actually seemed pretty solid too. Each player has a hand of cards, representing the crew of a fantastical ship. 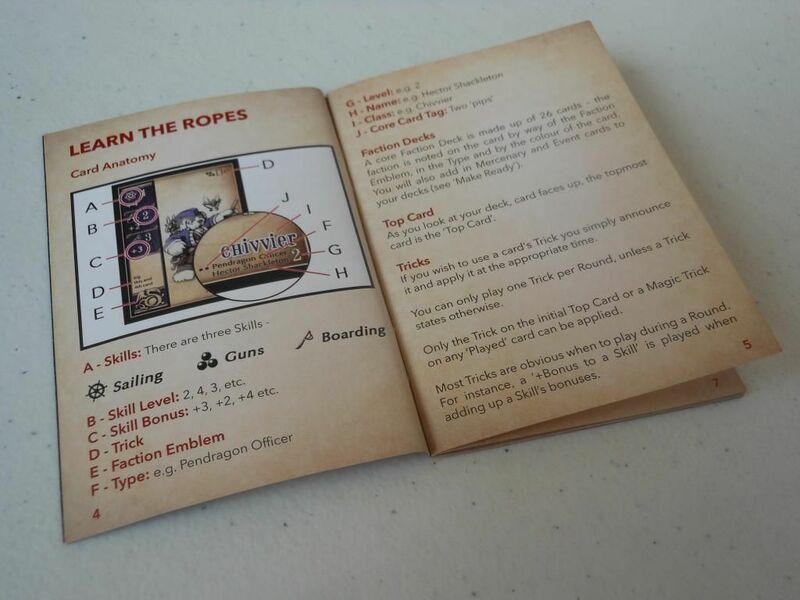 Each turn, the players pick a combat skill (steering, guns, or boarding) to attack with, and then they select one, two, or three of their top cards to commit to the fight. 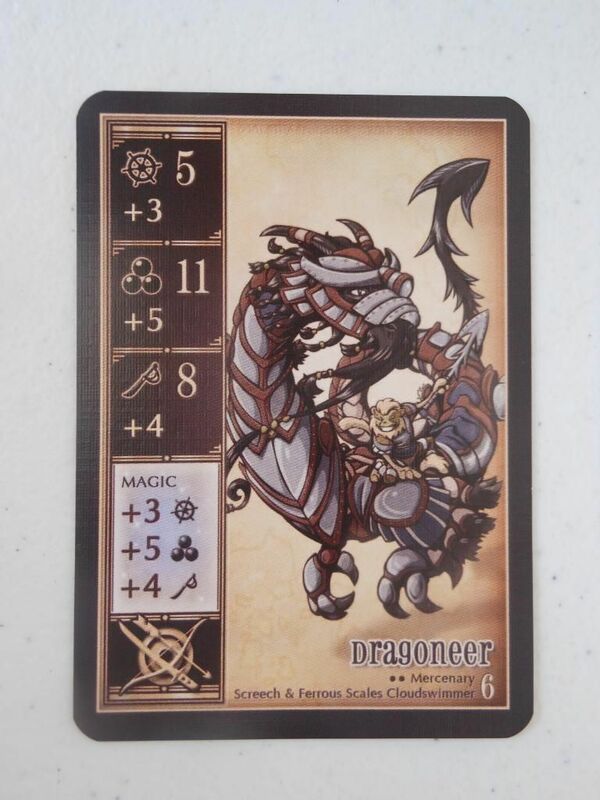 The top card has a primary value in the selected ability, and the other cards provide a secondary bonus value. The players reveal their totals, and the highest score wins. Most cards also have a special trick (which is a bad choice of word for a card game, where "trick" normally means a round of play). On each turn, players may play one trick, which in most cases is the trick on their top card. These tricks may add extra bonuses, or hinder an opponent in some way; but I'll talk more about them in a while. Once the players have determined a winner for the round, something happens based on which type of combat ability the winner used. First, both players discard all the cards they played. They do this by turning the cards upside down and placing them at the bottom of their decks. If the winner used steering, he or she may immediately search down the deck for the first two face down cards, and then recover them by turning them face up again. If the winner used guns, the loser has to discard an additional two cards. If the winner used boarding, the winner recovers one card, and the loser discards one extra card. If, at any point, a player's entire deck is face down, that player loses. So, that all sounds a little bit like Top Trumps with some extra rules tagged on, right? Sure it does, but I promise you, this is one of those games that is greater than the sum of its parts, and it really doesn't play anything like Top Trumps. In fact, there is a surprising amount of strategy packed into this little game. A little bit too much, really. While the basic concept is pick a combat skill, select a number of cards from one to three, and then compare results, there are a lot of other rules that feed into that basic framework and create a startling number of tactical options. The most obvious thing is the tricks, especially the ones that allow you to reorder the cards in your deck. However, perhaps even more interesting is the way in which the combats play out. For example, you may have a strong hand to win using the steering skill, allowing you to recover two cards; but you know your opponent only has a few cards left, so you really want to attack with guns to force extra discards. And then there is determining how many cards to play. Is it really worth playing three cards when you use the steering option? You have to discard all the cards you play, and then you would only get to recover two. Between the use of tricks, the use of special magic tricks that you can use even if they are not on the top of the deck, the decision of how many cards to play (and which ones), the decision of which combat skill to use, and the inclusion of special events that trigger if they turn up in the top three cards of a player's deck, it can all be a bit... overwhelming. You may actually end up looking at the top five or six cards in your deck, working out different permutations, and what would happen based on different outcomes in the current round. For a light filler game, there is a surprising risk of analysis paralysis setting in, and what should be a quick five-minute game may run a lot longer than that. It's like Top Trumps and Chess had a baby. 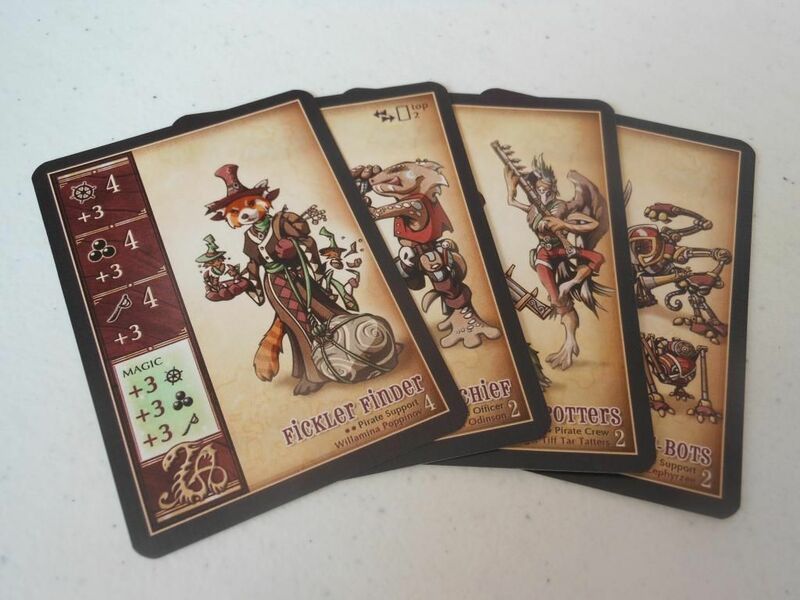 Now, normally I am not one to complain about having too many options; but I'm making an exception for oddball Aeronauts, because I think it is indicative of my main problem with the game: It really doesn't know what it wants to be. It dresses up like a quick 15-minute War-like game that you can break out with casual gamers in a bus queue; but it is actually a pretty meaty game, with a surprising number of special powers, and unusual combinations. And it comes with a "first player" token. 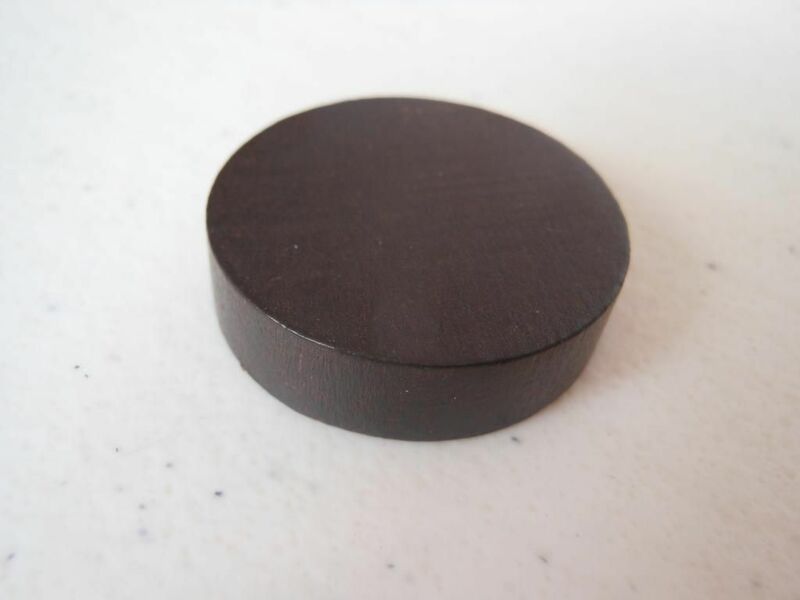 If I'm supposed to play this game in the hand without a table, where do I put this token, exactly? There are even deck-building rules, so you can construct your own personal decks. I have no idea what benefit there is to deck construction. It seems like a lot of effort; and does swapping a card that gives you +1 steering and +2 guns with a card that gives you +2 steering and +1 guns really make a difference? How would you even know in advance which of those cards is the better one to take, when the game is more about tactics than strategy? I have introduced this game to three different people now, and they have all said the same thing: It's a cool idea, and the way it plays in the hand is nifty (especially discarding cards upside down at the bottom of the deck), but there is a lot of "bloat" and "cludginess" that could have been excised for a smoother game experience. Ultimately, I think this game has suffered for going through the Kickstarter process. I know, I know... If it wasn't for Kickstarter, this game may never have existed. But, by going through Kickstarter, it seems like there was no-one to step in and say, "You know, you can probably remove that element of the game, or simplify it a bit." Now, what that power means is, if you play boarding, and your opponent plays steering or guns, and you have the lowest total score (therefore losing the round), you get to add +4 to your result, and if that means your score is now higher, the result of the round is a draw. That is a very specific combination of events required in order to trigger the trick, and the result if it does trigger seems a bit strange. It seems complicated for the sake of it. And almost every card has a different trick, a good chunk of which come into effect on the following round, if a certain condition is met in the current round. There are even tricks that you can only use if you happen to be the first player at the time. And then there are the rules... You didn't think I'd forgotten about the rules, did you? Rules - they ain't so hot. For a game that, at its core, is so simple, the rules are terrible. They are in no particularly coherent order, they are poorly worded, and at one point, rather than explaining when a player should play tricks, it just says, "most tricks are obvious when to play during a round." Rulebooks should never assume players are clever enough to figure out that sort of thing without a clear explanation, because one of the players might be me. Oh, and there isn't a single example of play in the rulebook, although there are several pages on deck-building, several pages of fluff, and some stuff about future faction pack expansions. For the first few days with the game, I had to study the cards carefully, constantly referencing the rulebook; and I had to ask multiple questions on BoardGameGeek (which the designer and other helpful people were good enough to answer). It certainly wasn't what I expected from a light game. 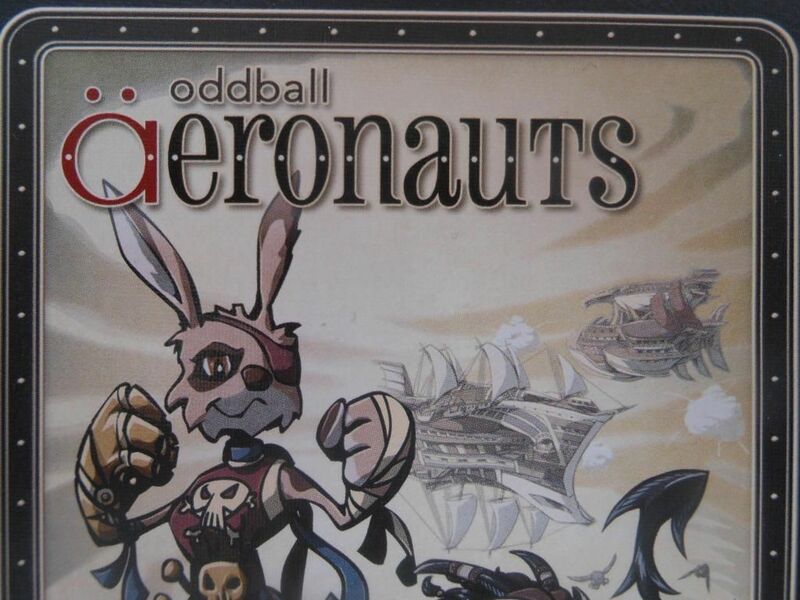 And I guess that sums up my review: oddball Aeronauts was not what I expected. Often, while I am playing, I notice I have started to think too hard about my next play. When this happens, I force myself to make a snap decision; because in my heart I know this is a light filler game that you shouldn't be thinking about too carefully. But my head strongly disagrees. It is not a bad game. Far from it. It is an incredibly clever game, with a surprising depth of tactical options; and I think a lot of people are going to enjoy it. But it just isn't as lean as I wanted it to be. It needed someone to come in and trim off some of the fat. It needed just a little bit more finesse. The game is certainly and oddball, and well worth checking out; but I do not think these aeronauts reach the lofty heights of their potential.